Huge amounts of precious funds have been wasted in the past on price subsidies purportedly for the benefit of weaker sections, a considerable share of which has however regularly been misappropriated by the well-off apart from layers of middle men. Targeted subsidies would be a far more efficient, cost effective and transparent mechanism of achieving results. Budget 2010 brings with it the promise of increased government’s brave new approach towards economic restraint also incorporates the rationalisation of subsidies and the deliberate movement towards targeted as opposed to generalised subsidies. This includes fuel, food and fertiliser subsidies which account for at least 90% of the government’s subsidy bill and is a much needed and very welcome development. Huge amounts of precious funds have been wasted in the past on price subsidies purportedly for the benefit of weaker sections, a considerable share of which has however regularly been misappropriatedby the well-off apart from layers of middle men. Targeted subsidies would be a far more efficient, cost effective and transparent mechanism of achieving results. A similar approach needs to be considered for expenditure on social welfare schemes aimed at rural health, education and communications. This developmental expenditure is both a social necessity and an enabler of overall economic growth. A healthy educated and connected rural population is a basic requirement for sustained economic development, especially in a populous nation like India. 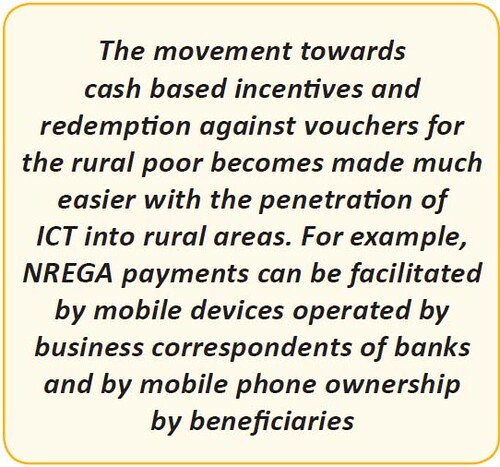 The movement towards cash based incentives and redemption against vouchers for the rural poor becomes made much easier with the penetration of ICT into rural areas. For example, NREGA payments can be facilitated by mobile devices operated by business correspondents of banks and by mobile phone ownership by beneficiaries. Promoting these two ICT enablers would itself represent a demand side measure towards universal rural financial inclusion and connectivity; a goal which has still not been achieved in spite of years of supply side initiatives focussing on bank branches and big telecom infrastructure projects. The Universal Service Obligation Fund (USOF) has been instrumental in bringing connectivity to villages through the public phones, individual lines, mobile services, broadband connectivity etc in the past and it is now supporting schemes to strengthen Optic Fibre Cable (OFC) capacity at the intra-district level. Recognising non-availability of grid power as a major constraint, USOF is also actively working to support renewable energy installations in rural telecommunications. This is a unique programme because subsidy is paid only on the achievement of specified outcomes. Further, the process of verification/monitoring is integral to scheme design and solidly linked to payment. However even with such a wide range of well implemented activities, it is often pointed out that rural telecom penetration at about 21% is seriously lagging behind urban penetration levels of 110% and much more needs to be done. It is easy to appreciate that this huge gap arises because of both supply side and demandside constraints. The former include inaccessibility and remoteness of villages, lack of supporting infrastructure such as roads and power, difficult topography, insurgency etc all of which increase the cost of service provision. The latter includes sparse, scattered and relatively low income population, lack of commercial activity (and hence demand) and lowliteracy levels (affecting demand for broadband) in rural areas. All these translate into lower revenue per user. Together these demand and supply side constraints deter service providers from venturing too deep into rural India. Even when subsidised infrastructure is made available and tariffs are low, several demandside constraints can prevent the uptake of ICT services frustrating the aim behind the supplyside developmental expenditure. In the case of broadband for example, unless broadband enabled services are user-friendly, in local languages and can cater to the needs of the illiterate they will not be useful to the rural masses. Even if we focus primarily on aggregated demand by way of broadband cafés, schools, colleges and health centres, the training of facilitators (franchisees, teachers and health workers), curriculum changes, linkage withurban universities and hospitals etc are necessary conditions for meaningful demand generation. When mobile towers come up in isolated rural areas, the poverty levels of the local population and handset costs act as dampeners to the uptake of connections and this in turn seriously threatens the viability of service provision, inspite of supply side subsidies. All this leads to the conclusion that more needs to be done on the demand side. Tacklingdemand side issues requires effective coordination and linkage amongst various governmentdepartments and programmes. USO F has in the past collaborated with the Ministry of New and Renewable Energy for setting up renewable energy installations for powering rural telecom facilities. Similar collaborations are required with the Departments/Ministries of IT , Rural Development, Health, Education, NABARD, UIDAI etc to make rural connectivity meaningful. The launch of the National Rural Employee Guarantee Programme (NREGA ) programme and setting up of the Unique Identification Authority of India (UIDAI ) are two path braking initiatives which will pave the way for targeted demand side welfare schemes. The former entails a major exercise in identifying the Below Poverty Level (BPL) families who are to benefit from job guarantees and in provision of job cards to them. Already the government is working to extend other social benefits such as health insurance through the (Rashtriya Swasthya Bima Yojana or RSBY) to NREGA beneficiaries. The UIDAI programme will record biometric and other details of residents and assign thema permanent identity number. The latter can be used as a basis to transmit various government benefits to identified categories of individuals such as BPL population without the risk of fraud. The lack of proper identification and fear of misuse has in the past prevented the implementation of individual based subsidy/benefit programmes. Ifrural BPL families can be correctly identified, they can be the beneficiaries of a number of directed subsidies saving the government crores of rupees spent on price subsidies and leaky public distribution systems. In telecom, this could mean a special subsidised rural mobile tariff plans for the BPL identity (ID) holders with life time free incoming calls and guaranteed minimum monthly recharges. Eligible telecom operators providing these services could be reimbursed from the USOF. For purchase of handsets, USOF could arrange to tie up with agencies like NABARD to ensure microcredit on concessional terms to BPLFamilies. To prevent misuse by way of resale/misappropriation of subsidised handsets and SIM cards, they must have an intrinsic value for the beneficiary, beyond mere connectivity. To this end, the government should ensure that all personalised benefits such as NREGA paymentsare channelized to beneficiaries through their mobiles. Further, state governments can use these mobiles for free educational and informational broadcasts and query services (voice and SMS) on topics such as agriculture, animal husbandry, health, education, government schemes etc by tying up with VAS providers, thus creating much needed awareness on these issues and a useful feedback mechanism, while also adding greater utility to mobile ownership. The mobile is a much cheaper medium of money transfers than smart cards, AT Ms, internet and bank branches. The linkage between the BPL ID and the SIM numberwould substitute the Know Your Customer (KYC) formalities for banking and can enable thechannelization of a host of government benefits. Once mobiles are ubiquitously available to the poorest of poor, the supporting eco systemof local shopkeepers, telecom retailers, business correspondents and VAS providers would receive an impetus and could be put in place fairly easily . Mobile banking would enable the BPL population to access their no frill bank accounts remotely. Even if a BPL villager were to receive his NREGA wages through a business correspondent or post office, a voice/written SMS on his mobile phone can help him be sure of the amount due to him and transferred to his account, show him bank balance, allow him to withdraw the chosen sum and give a confirmatory feedback to the payment system on receipt of wages. Similarly, a code numberreceived via SMS could entitle the BPL mobile holder to concessions on food/fertiliser/fuel prices from the local stores or the SMS could be accompanied by an airtime transfer whichitself could be exchanged for food/fertilizer/fuel to which the BPL individual is entitled. Aided by biometric authentication devices linked with remote servers through broadband connectivity, this becomes a fool proof delivery mechanism. A large segment in bureaucratic circles is highly sceptical about the success of demand side initiatives and targeted subsidies such as those outlined above and for good reason. Such scepticism could turn out to be well justified unless programs are carefully designed and rigorous monitoring and review mechanisms are in place to prevent frauds. Criticswould of course quote past implementation failures and infamous leakages as reasons for their doubts. Given this background, fairly uncomplicated, supply side schemes are preferred in bureaucratic circles. Unfortunately, this often implies studiously avoiding uncomfortable ground level nitty-gritty’s at the cost of achievement of desired results. The author feels that the country can no longer afford to rely solely on relatively undemanding but often wasteful, or only partially effective, supply side initiatives. Effective ground level implementation has to be tackled no matter how daunting the task. 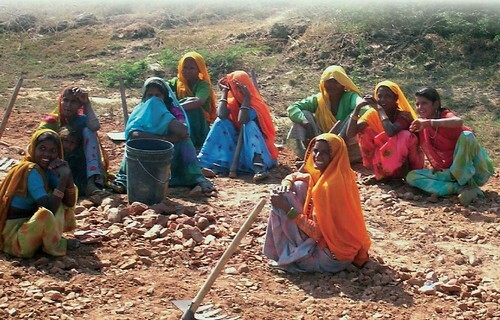 It has been rightly said that the bureaucracy needs to be trained to thrash out details and be unafraid of ‘plumbing and execution challenges’ and it must overcome its present ‘fear, contempt or aversion’ for operations.’ We need to draw inspiration from the NREGA programme which has often been criticised for leakages. There are horror stories about wage transfers to doctors and engineers in the North-East and leakages of up to Rs 850 crores in U.P. However, the government has responded by introducing no frill bank accounts, ICT enabled solutions, social audit and independent village level monitors to strengthen execution and monitoring; and certainly not by giving up. The universal spread of rural ICT which itself requires targeted demand side initiatives along with supply side infrastructure provision, constitutes a critical enabler and facilitator of other targeted welfare schemes and must be given the priority and attention it deserves, regardless of the undoubtedly testing operational issues involved.